When did Cheyenne people meet Europeans? In 1680 AD, Cheyenne people were living around the sources of the Mississippi River (in modern Minnesota), when they sent representatives to meet with French fur traders at La Salle’s fort and urge them to come to their country, where there were plenty of animals for fur trapping. Why did the Cheyenne move west? About 1700 AD, the Sioux pushed many Cheyenne people out of their home in the Great Lakes, and the Cheyenne settled further west on the Great Plains (in modern South Dakota and eastern Montana). 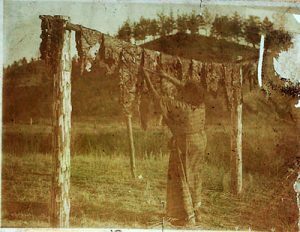 In their new home, the Cheyenne people once again took up farming. They soon developed more government structures than their neighbors. In the Dakotas, the Cheyenne lived in earth-covered log houses. Why were the Sioux moving west? When did the Cheyenne get horses? Cheyenne people got horses soon after their arrival in the Dakotas, thanks to the Pueblo revolt of 1684. The Cheyenne then traded horses to the Sioux and other people. 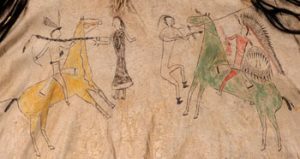 But only a few years later, the Sioux used their new horses to push the Cheyenne people out of the Dakotas and further west. Why did the Cheyenne stop farming? Some Cheyenne people ended up as far west as southern Colorado. In Colorado and Montana Cheyenne people had to give up on farming and, like the Crow and the Sioux, Cheyenne people began living by using their horses to hunt bison. Like other people of the Great Plains, they began to live in tipis. In the 1800s, the Great Plains were crowded with Native Americans. White settlers had pushed them all off their land and they had nowhere else to go. Cheyenne men fought wars with the Crow, who were also being pushed on to the Great Plains, and with the Kiowa to their south. In 1849, a cholera epidemic further reduced the numbers of Cheyenne: as many as two-thirds of them may have died of it. By 1850, the United States was trying to settle the Great Plains as well as places further east, and Cheyenne men engaged in a series of wars against the United States Army to try to keep some land. The end of the Civil War in 1865 meant that many more United States soldiers came west to fight the Cheyenne. So by 1879 the United State Army had forced most Cheyenne people to live on two reservations. One reservation is in southeast Montana, and the other is in western Oklahoma. There are still many Cheyenne people today. There are many more than there were in the late 1800s. Today, most Cheyenne people have jobs. Many work as foresters, fire fighters, and in other ways preserving their land. Did you find out what you wanted to know about Cheyenne history? Let us know in the comments! Cite this page: Carr, K.E. Cheyenne and cholera – American history. Quatr.us Study Guides, August 12, 2017. Web. April 26, 2019.